It's time for Ford to quit messing around and give us a Mustang ST. Take a moment to imagine everything that makes the Fiesta and Focus ST so brilliant transposed onto the already delicious Mustang. The line follows a predictable recipe that starts with an Ecoboost four cylinder. In stock tune, the 2.3-liter turbo four in the 2015 Mustang turns out 310 horsepower. The aftermarket has already demonstrated how easy it is to pull an additional 90 horsepower from the smaller 1.6-liter and 2.0-liter engines in the Fiesta and Focus with nothing more than ECU calibrations. A 400 horsepower turbo four Mustang sounds pretty good. GT buyers need not sweat their egos. That number's still down from the V8's output, but the Ecoboost weighs around 173 pounds less than the range-topping bruiser, which would make for some great sibling rivalry. Throw in a throatier, center-exit exhaust, and you've got the start of a brilliant machine. As with the hatchbacks, it makes sense for the Mustang ST to only be available with a manual transmission. This is an enthusiast car for a very specific buyer. The easy move would be to transpose all of the goodies from the GT Performance Package onto the Mustang ST. 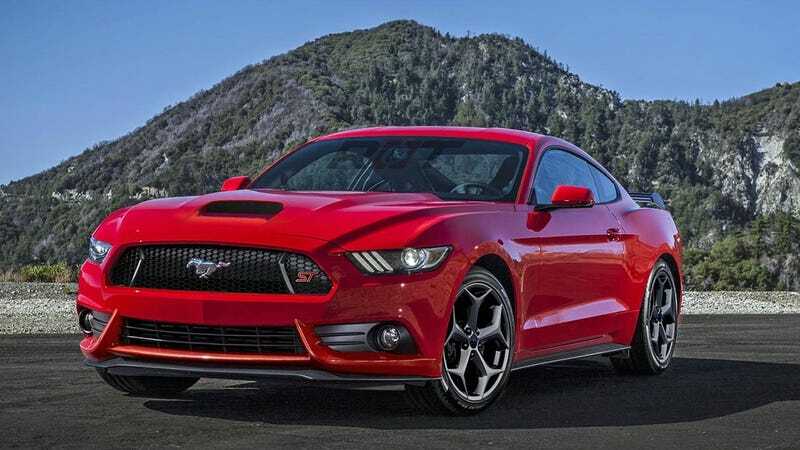 Bits like additional bracing, bigger sway bars, stiffer springs, specific dampers, and massive Brembo six-piston brakes (available only on the GT Performance Pack at this time) would all go a long way toward giving the Mustang ST the teeth it needs to keep up with the additional power. So would a 3.73 Torsen limited slip rear axle. Of course, big, 19-inch five-spoke wheels wrapped in summer performance rubber wouldn't hurt, either. Outside, the Mustang ST borrows from its smaller brothers. Unique aero work, including a tweaked front fascia with mesh grille insert, aggressive splitter up front, and dramatic side skirts make up the majority of the changes. Of course, we couldn't resist throwing in a menacing hood scoop as an ode to the Mustang SVO of yore. A tweaked rear valance, bold spoiler, and ST badges round out the changes outside. Indoors, expect to find meaty Recaro buckets, a beefy leather-wrapped steering wheel and ST-specific shift knob. How much would it cost? Ford's done a great job of keeping the ST line affordable, usually within $5,000 or $6,000 of the cost of a base car. That would put the Mustang ST at around $31,170, or just under a base GT. Yeah, that sounds about perfect. If you agree, start hounding Ford. All the parts are on the table, it's just a matter of someone throwing them together. Head over to the company's Facebook page. Pester Ford on Twitter. Let them know we're serious. It's time for the Mustang ST.
Renders by Theo Chin, Chris Doane Automotive.